Liverpool face rivals Everton in the Merseyside derby this weekend, and Jurgen Klopp will have Sadio Mane available for the clash. As noted by the Liverpool Echo in midweek, the 26-year-old emerged as a doubt to face Paris Saint-Germain in their crunch Champions League clash due to illness, but he recovered in time to feature. Now, as per the tweet below from freelance injury analyst Ben Dinnery, Klopp has confirmed that the forward hasn’t had any further issues following on from that and is set to get the green light to feature. Given that Mane has bagged seven goals and provided three assists in 18 appearances so far this season, he is crucial to Liverpool’s hopes of securing all three points and so Klopp will be delighted to have him at his disposal on Sunday. 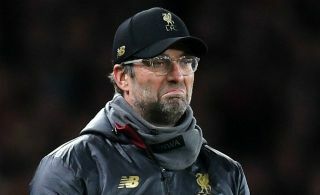 However, the German tactician did add in his press conference on Friday that trio Adam Lallana, Dominic Solanke and Divock Origi are all expected to miss out with various injury troubles. Given the lack of playing time that they’ve had so far this season though, they shouldn’t be a huge loss for the Reds, and so the Mane news undoubtedly outweighs the negative updates on them. Liverpool will be looking to bounce back following their disappointment in Europe in midweek after their loss to Paris Saint-Germain. As they continue to sit just two points behind league leaders Man City, the last thing that they will want this weekend is to drop points and see that gap open up ahead of a busy festive period which could be crucial in the title race.